January 22, 2018 By Erika C.
Want a chance to win an AquaGrove aquaponics system? 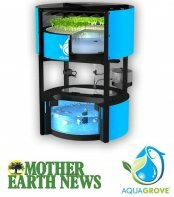 Thanks to the latest launch with Mother Earth News, AquaGrove is inviting home growers, educators and anyone interested in aquaponics to enter to win the first ever AquaGrove Giveaway offered by the company. Part of AquaGrove’s mission is to educate and provide sustainable solutions for gardeners, growers and educators, making healthy and nutrient-rich organic food easily accessible to anyone, in nearly any climate. Now, attaining an AquaGrove couldn’t be easier with the latest giveaway that is open to the public. With the system being easy to set up and low maintenance, it is a great way for growers to get started with the endless food cycle that is possible through AquaGrove. The system doesn't require any special technical knowledge to install or operate, and it is an ideal educational tool for students of any age, teaching sustainable agricultural practices, earth sciences, and much more. Your next AquaGrove could possibly be just a click away. It’s easy to enter the giveaway – Simply go to http://www.motherearthnews.com/aqua-grove.aspx and complete and submit the entry form found there. Entries are limited to one per email address. For more information and official rules, please visit the official rules webpage. Wishing everyone good luck and green growing!